Note from the Preface by Wright. The Sloane MS., from which the present collection is printed, has been generally ascribed, from the character of the writing, to the reign of Henry VI [1422 to 1461]. I have thought, therefore, that it would not be unacceptable to the readers of our old poetry, if I gave a complete edition of the Sloane Manuscript, as a companion to the volume printed for the Percy Society. Now in the Bodleian Library and known as "MS. Eng. poet. e. 1." Both manuscripts are believed to have been owned by 15th Century Minstrels. Twenty songs from this manuscript were printed earlier by Mr. Wright in Songs and Carols Printed From A Manuscript in the Sloane Collection in the British Museum (London: William Pickering, 1836). Songs and Carols Printed From A Manuscript in the Sloane Collection in the British Museum (London: William Pickering, 1836). Twenty songs and carols from Sloane MS 2593. Specimens of Old Christmas Carols Selected from Manuscripts and Printed Books (London: The Percy Society, 1841). Reliquiæ Antiquæ. Two Volumes. (London: John Russell Smith, 1845). With co-editor James Orchard Halliwell. Songs and Carols Now First Printed From a Manuscript of the Fifteenth Century (London: The Percy Society, 1847). From MS. Eng. poet. e. 1 now in the Bodleian Library; believed to have been owned by 15th Century Minstrel. Festive Songs Principally of the Sixteenth and Seventeenth Centuries (London: Printed for the Percy Society by Richards, 1848). Songs and Carols from a Manuscript in the British Museum of the Fifteenth Century (The Warton Club, 1856). Songs and carols from Sloane MS 2593. Believed to have been owned by 15th Century Minstrel. Songs and Ballads, With Other Short Poems, Chiefly of the Reign of Philip and Mary (London: J. B. Nichols, 1860). Composed of 77 songs and ballads in 212 pages. For the Roxburghe Club, from a 16th Century Manuscript by Richard Sheale in the Library of the Ashmolean Museum at Oxford, MS. Ashm. No. 48. The reign of Queen Mary was from 1553-1558; she was succeed by her half-sister, Queen Elizabeth I. Concerning the Sloane MS 2593. The editor of the MS. (Mr. T. Wright) observes that “The great variations in the different copies of the same song, show that they were taken down from oral recitation, and had often been preserved by memory among minstrels, who were not unskilful at composing, and who were not only in the habit of, voluntarily or involuntarily, modifying the songs as they passed through their hands, and adding or omitting stanzas, but of making up new songs by stringing together phrases and lines, and even whole stanzas from the different compositions which were imprinted on their memories.” But what renders the manuscript peculiarly interesting, is, that it contains the melodies of some of the songs as well as the words. From this it appears that the same tune was used for different words. 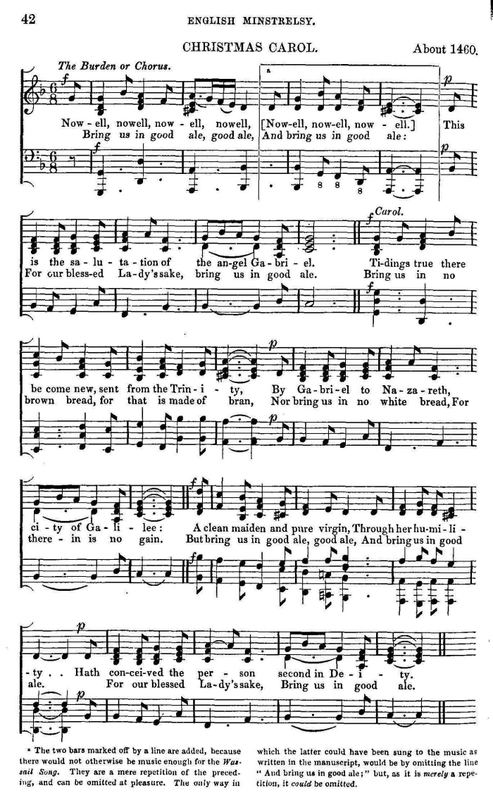 At page 62 is a note, which in modern spelling is as follows: “This is the tune for the song following; if so be that ye will have another tune, it may he at your pleasure, for I have set all the song.” The words of the carol, “Nowell, Nowell,” (Noel) are written under the notes, but the wassail song that follows, and for which the tune was also intended, is of a very opposite character, “Bryng us in good ale.” I have printed the first verse of each under the tune, but it requires to be sung more quickly for the wassail song than for the carol. Note: The full Table of Contents is reproduced, although only songs related to the Christmas-tide are reproduced on this site. Editor's Note: Because Middle English contains letters not found in modern English, I've used a special font, "Junicode" created by Professor Peter S. Baker, Professor of English, University of Virginia on some pages. I will note on the individual carol's page which ones need this font. You can obtain a copy of this font from his website Old English at the University of Virginia (select "Windows TrueType," or right click here, and then select "Save File As" to save a copy of the zipped file to your computer). This font must be downloaded and installed before these pages will display accurately. Note: I have just begun to extract songs and carols from this collection, but limited to songs of the Christmas-tide, which I define as from the first Sunday in Advent through the Presentation in the Temple, February 2. There are other songs and carols not for the Christmas-tide in this collection, however. Please check back soon. Additional historic songs and carols from other collections edited by Thomas Wright will also be forthcoming. As I found myself retyping, formatting and attempting to add new-to-me songs, I found that I already had that song or a similar song from another collection. For this reason, I've attempted to go through the collection, and have added one or more links for some entries. Those links will be removed when the song is added from this collection, or is identified as being an identical song from another collection. And thynk on lyf that lestenit ay. Nowel, el, el, el, el, el, el, el, el, el, el, el, el, el, el, el.